Filling up the Midland (here about half the students are in the theater) for the Alvin Ailey student program. One of the most striking things about the Ailey company is not their talent or superb delivery or their choreography, all of which they have. Of course. What seems most striking is the easy self-confidence and strength of this company. At age 50, the Alvin Ailey American Dance Theater still feels fresh, with the vitality of a young company with the assurance of five decades of experience. They don't have to prove themselves, and they are not trying to live up to their reputation. The Ailey dancers just dance, and you understand why they are among the best dancers in the world. Then there is the other thing, community outreach. The school kids are bussed in from across the greater metro area in the morning, prior to their regular-program concerts. And not just for the concerts, for camps (Ailey Camp) and for in-school programs. The kids know they are not here because they are stuck watching a dance concert. They already know that the Ailey people have been and will be at their schools to give classes directly. These kids prance through the door, pumped. Kindergarten through high school senior, each pay $6 which is cheaper than a movie these days - no popcorn, though. For every 30 students Ailey requires two adult chaperones (free). Any additional chaperones are $6 each meaning you can squeeze in a few friends for a great one-hour show and some light kid-sitting. Ailey really makes access to great dance possible for a huge swath of the community. You really have to be in the middle of this vast sea of kids when they start cheering, clapping and hopping up and down "in" their seats. Whatever Ailey means to the kids, they are anything but restrained. 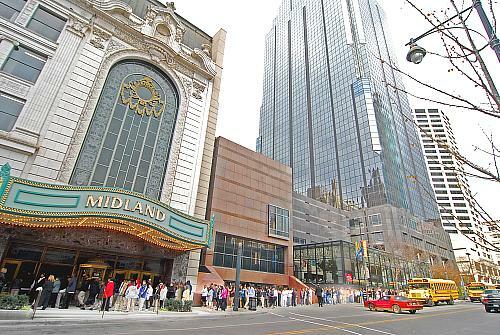 You start to get a taste of the kid-dancer connection as the lines of school kids enter the Midland and are greeted by the Ailey staff. They already know each other. Again and again you hear the staff ask how someone is doing, how is your sister, how are your folks, say hi to ... and so on. Handshakes, hugs and big smiles. Talk about choreography if you want, choreography is certainly important, but really pay attention to those human connections. When the announcer on stage asks a question, the young audience yells back the answers. The youth performances are a sandwich: dance performance at the start, dance performance at the end and in between a demonstration / short-lesson explaining the ingredients which go into the performances. This demo/lesson is reminiscent of the NY Philharmonic Young People's Concerts which began in 1924 (with earlier precursors) and was first regularly televised under Leonard Bernstein in the late 1950's and 60's. (see ** links at bottom). It should be noted that Bernstein's first season was in 1958, the same year as Ailey's Blues Suite and the start of the Ailey company. Bernstein took the seemingly high-brow symphony and made it accessible and fun for the kids. The Ailey performers also bring to young people a direct and meaningful connection with an art form which might otherwise be seen as far removed. The conversational ease of the Ailey presentation drew the kids right in. They shouted out responses to queries from the stage and cheered as each step in the choreograph was put in place, the dancer, the steps, the music, the lighting. Then all the steps together in a few seconds of performance. More cheers. On the second morning of the youth performance a light bar was lowered from the top of the stage. Some of the lights pointed into the audience so that they could join, in groups, into hand clapping, not on the one-count, but on the two-count. Laughter and cheers as they "competed" against the only two other towns, said the MC, in the entire US which had managed to not clap on the one, but get it correctly on the two. That upped the ante and the fun was joined. One of the more perplexing parts of coming for this 50th anniversary show for Alvin Ailey American Dance Theater (AAADT)combined with 25 years for KCFAA (Kansas City Friends of Alvin Ailey and 20 years for Ailey Camp was the program. Or rather the programs. The shows changed from performance to performance. Never the full 50-years of reflection in a single show. So you are almost certain to get a fractional 50-year show, rather than a full retrospective. Ailey did do a "highlights" piece combined with various full and extracted pieces. While I certainly appreciate the difficulty in making choices of what to show for a 50 year retrospective it seemed that each audience would get at least somewhat shortchanged in some way. The saturday matinee had only three pieces, two of which were not Ailey choreographies. Only "Night Creature" was true Ailey. Both ground breaking and trendy at the time it is neither today yet manages to remain extremely satisfying simply because the the moves are natural to the music. "Night Creature" does look like a creature from its time, yet without feeling dated. That is because the moves fit the music so well they avoid gimmicks. This is just straight on dance and is done with an elegance and smoothness which give it a sense of power in execution. The overall concert selections cover 30 years of Alvin Ailey's choreography, from 1958 to his final piece in 1988, before his death. Children up close with "Revelations"
"Revelations" is one of the oldest pieces in the repertory (1960). 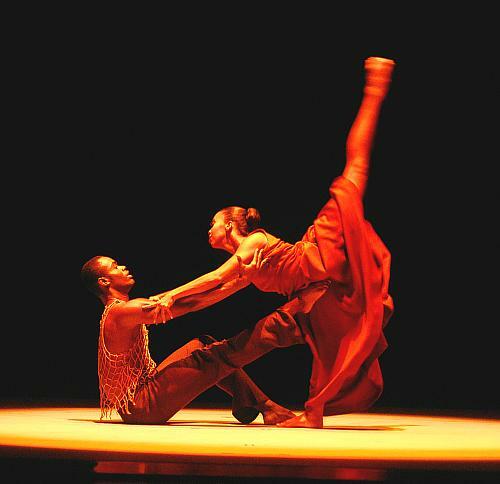 Revelations is the "anthem" of Ailey. It is the one every Ailey dancer has to dance before "really" becoming an Ailey dancer. A rite of passage. "Revelations" remains fresh and undated much as if it were a new choreography. 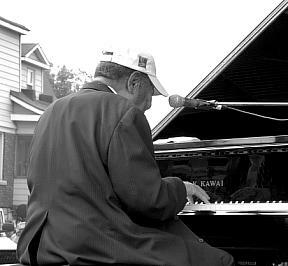 "Revelations" is one of those pieces which doesn't seem to belong to a particular period of choreography or music. The first time I saw "Revelations" I remember both the audience and the review later. The person writing the review for the paper thought Kansas City was now too sophisticated for a piece like Revelations. Time to retire it, she wrote (I don't remember her exact words, this many years out, but that was the gist). My experience with both the piece (as audience member) and observing the audience around me was very different. "Revelations" was last on that program and the audience was a mix of people, some of whom were clearly regular whoopers and hollerers but who were more or less sitting on their hands and just finger tapping. Determined, I guessed, to be extra sophisticated. Then there were those who obviously were, as a practice, a bit more aloof as an audience and were clearly finger-tapping clappers rather than heavy-handed clappers. Regardless, by the end of "Revelations," everyone was hooting and hollering and knee-slapping away. Smiles were ear to ear and they were high-stepping (relatively) on their way out of the theater. One only hoped they wouldn't high-step the gas pedals in their cars on the way home. The kids in the Youth Program audience were no different, except that they left in busses to return to their schools. So 48 years on and this piece is still getting the audience to whoop, holler, grin and high-step. Adults and children alike. This piece is not ready to retire, at all. I've come to realize that my experience of shooting dancers in terms of ease seems related to their ability as dancers. They easier someone is to get good dance shots of the better they tend to be as dancers or at least the better they fit the dance they are performing. The better a company is the easier they are to shoot. At least that is my experience. Ailey is incredibly easy to shoot. They are right on the mark (very crisp), again and again and they hold it at that spot for a very (relatively) long time. And not only as soloists but in duet and even in large groups. The latter being even more challenging. If you can't shoot anything decent with Ailey you really need to go back to flower shots. Dancers who are not at that top level may not hold the positions for so long, or may not reach the positions fully or even at all (rolling off before they get there) or get there but with bent leg which should be straight and so forth. Or in groups mostly coordinated but with one or two, sometimes more, who look a bit lost. These dancers are actually tougher to shoot. The feeling for me is almost physical as if I were reaching for something and found myself blocked. With top level dancing I feel unhindered. I speculate that this sensation of blockage is neurological feedback. Whatever the mechanism behind the sensation, it tells me about either the dancer or dancers or my own alertness or both. The Midland is such a beautiful old theater, what can you really say about the ornamentation which was restored recently. A leftover from an earlier era? Classic looks right out of an old movie? That said, I should note the not so wonderful which need help: parking, box office and seating. The box office arrangements belong to the theater and the parking is a matter for the city and all downtown merchants. Box office first. Most of the time I am somewhere in a crew position, on camera, so I seldom have to go through the travails of a regular audience member. Indeed I am usually told to go in the back door, not the front. This time, after two days of working camera during the youth performances, I came back for a review. The ticket window was around the side, outside to the south and then a quarter of the way down the block west. Will-call, it turned out didn't have our tickets although someone I assumed to be a manager got us two tickets anyway. But we weren't the only ones who had problems getting pre-arranged tickets. And in any case, having to go half-way around the block, outside at that and on a cold day, seemed a bit short sighted. Most of us came to the main doors, naturally enough. Then, after being in line, were told we had to go around the block for the tickets. It was just enough to keep us from being seated for the first part, so we missed out. Yes, they did lead us around to a higher-than-nosebleed platform area on the fifth floor until the first intermission when we were finally able to get some seats. The parking is in various parking garages including the one right next door, to the north - at $4 per hour with a max of $12 in a 24-hour period. I spent $9 and $12 during the youth performances. Although those are both amounts I can pass on, it is still a bite. For the saturday matinee we found another location, at some distance, by the Lyric. 36 years ago, in my last months in the Air Force, I came through Kansas City. There were lots of people still downtown, and it was already in decline. These days no one comes downtown just to wander around. You really need a special reason and everytime you do show up for one of those special reasons you get handed the not-so-welcome sign of parking fees again and again. I've heard way too many arguments about the need to pay for parking downtown. They are self-defeating arguments. The people just go elsewhere. I sure do. I've never heard a shopping mall make those arguments for their free parking lots. Nor have I ever heard of anyone in a shopping mall getting penalized for spending too much time around the shopping counters. For decades now the results have been a sad loss to the downtown area. When the original J.C. Nichols started the plaza he rejected the then new-fangled parking meters,. the better to control the awful plague of customers. Nichols even transported potential customers from the end of the trolly line at 47th to wander in and shop in the plaza. Parking was just an extension of floor space in stores. You wouldn't charge a customer to stand around in your store and you wouldn't tell your customers they were spending too much time shopping in your store. But that is exactly what parking charges tell each visitor to the downtown. So, potential customers, shoppers, go elsewhere, and the bean counters never see the numbers. There is a lot more I can say about parking and the stadium but that is really a "whole 'nuther blog." 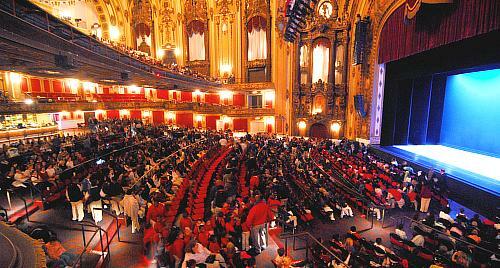 Beneath the lovely, ornate facade of the beautiful Midland Theater, Kansas City dance audiences were treated this week to a varied set of concerts highlighting one of the biggest influences in contemporary concert dance choreography, the late Alvin Ailey. 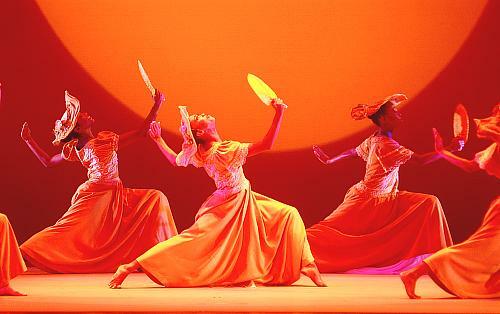 The Alvin Ailey Dance Theater celebrates its 50th anniversary this year with a tour featuring a wide selection of pieces from their repertory in order to present an historical retrospective of the company's work. Sponsored in a collaboration by the Friends of Alvin Ailey, Harriman Arts, and others, a number of different performances were presented with completely different programs for matinee and evening shows on Nov. 13-15, with a repeat of the Thursday night performance on at Sunday's matinee, for a total of four different programs spread over five performances. The Thursday night and Sunday matinee programs featured more of Alvin Ailey's earlier works, mostly choreographed by Ailey himself. In the last few years of his life, before his untimely death in 1989, the company began to use more and more pieces from other choreographers that fit the Ailey style of dance. 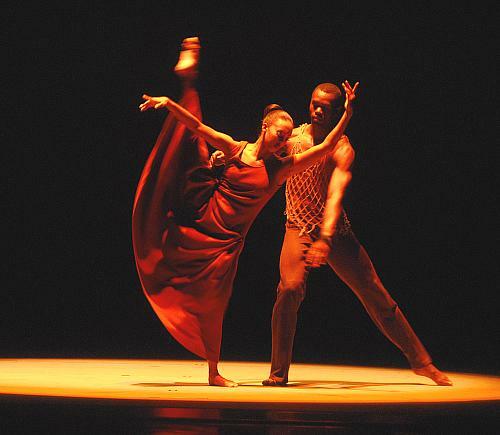 From the 1980s on, the Ailey company began to add more and more compositions choreographed by other artists, adding to the range of their repertory. This review will cover the special school performances given by the Ailey company for KC area school children, as well as the Saturday matinee. 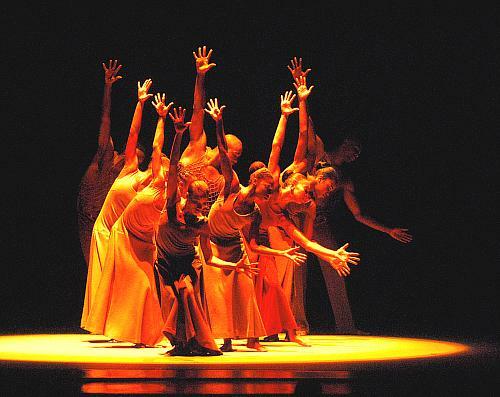 Each show opened with a short video, titled Alvin Ailey American Dance Theater at 50 -- A Golden Anniversary Celebration, which gave a narrative account of the history of the Alvin Ailey dance company. This video served to give a context to audiences for the part of the repertory they would be viewing for that day's program. The first number on the Thursday matinee's program was Night Creature (1958/1963), a 17 minute suite of Ailey's sensuous choreography interpreting the smoky jazz sounds of Duke Ellington. Performed in white and blue outfits, under patterned light designs, the mood of the piece was nocturnal and the moves were sinewy and fluid, articulating every part of the body to the bluesy rhythms. 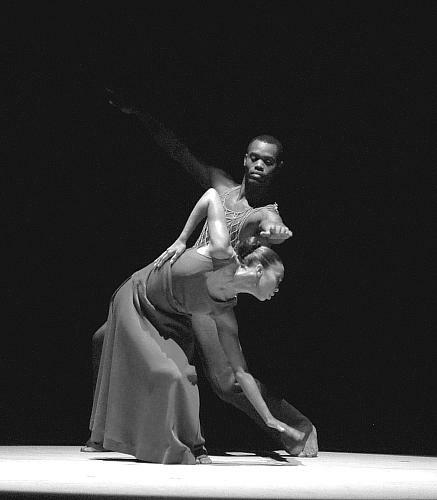 The second piece on the program was the 1986 piece, Vespers, choreographed by Ulysses Dove to the music, Quorum, by Mikel Rouse. Also running 17 minutes, the music for this piece is composed basically of complex combinations of electronic rhythms, and it is used as the vehicle to express in movement the internal emotional dialogues of women in a religious setting. Performed in simple, plain black dresses by an all-female cast in identical bun hairdos, the movements in this piece seemed to contrast the reaching for enlightenment with the earthy, raw (and often conflicted) feelings of female physical power. 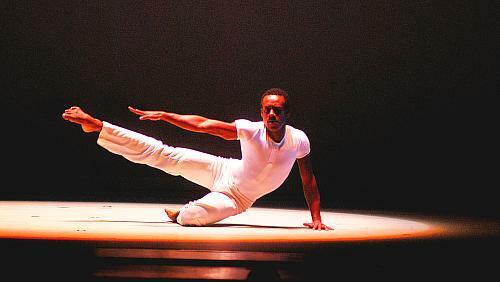 Dove, a former Ailey dancer, has had his choreography be part of the Ailey repertory since 1980. Dove successfully articulates the Ailey style within his own work, making an appropriate addition to company's repertoire. The last piece was a new addition to the Ailey repertory, Festa Barocca, choreographed by acclaimed Italian choreographer, Mauro Bigonzetti. This long piece (44 minutes), had several movements set to operatic music in contemporary baroque style. The dance integrated classical dance moves, inspired by court dances, with athletic modern dance moves to present an almost satirical (and sometimes humorous) caricature of performance dance. This piece was almost reflective in its self-referencing pastiche, as the dance called on many dance styles and juxtaposed them in opposition with each other. Performed in colorful satin skirts on both male and female dancers, the complex choreography was often as challenging to watch as it was to perform, because of the concentration of complicated moves in a small amount of space and time, creating a flurry of activity. An unusual piece, it not only displays a great deal of dancers' technical ability, but also seems to present a commentary on the evolution of dance into a very technical art form. The original Ailey works still have a great deal of power, and we tend to forget today how innovative the Ailey style was for its time. 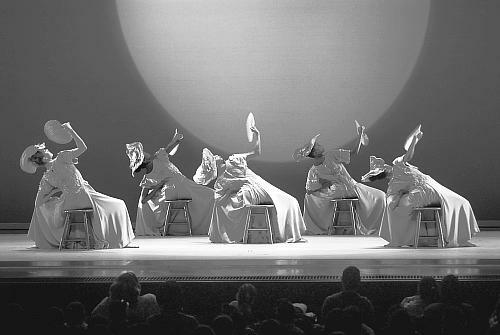 When Ailey began, the choreography was unique and new to audiences, as well as very political, since there were not a lot of black companies at the time, and especially those highlighting black culture in their themes. These early works still pack a wallop. One wonders, however, where the Ailey company will be able to go from here. So much of the Ailey movement and style has become part of regular modern dance vocabulary, it is likely to either change its style (which it has over the years), or risk being frozen in time as codified masterpieces, not unlike the Balanchine ballets (which seems to have also occurred). It is always a difficult balancing act to try to capture the ephemeral art of dance, and inscribe it in some way, as a legacy work of art, and yet keep the creative work fresh and timely and relevant. Both approaches are very important and needed, but the approaches are often in conflicting tension with each other.